EVERYTHING BEGINS IN THE HOME, DOESN’T IT? The moment I first heard Tigrinya, I knew it would be a part of my life forever. Too bad, I don’t remember when that actually happened. I am from The Bronx — the borough north of an island called Manhattan — in a small world known as New York City, and for the first 20 years of my life, I didn’t know how to read Tigrinya — my parent’s native language. In 2015, I encountered Haben online. Then, unemployed and bored, I had spent hours on the internet every day scouring the interwebs for work. I sent emails to peers in hopes of adopting the tactics that they had used to get a journalism job and began shooting off promising letters to employers wishing that I would, too, win an interview and a job. Searching for work also meant figuring out what to do with my downtime, so I considered exploring a short stack of English to Tigrinya language books and cards that I picked up in Asmara the summer before when I visited in 2014. One of the books showed pictures of animals, people, clothes and other everyday items and is mentioned in greater length in a 2015 blog post titled “Why You Shouldn’t Be Afraid to Learn Your Mother’s Tongue”. Speaking my mother’s first language had always been challenging; I didn’t like the way I sounded when Tigrinya left my lips because it didn’t sound as beautiful when I heard it spoken by others. I also believe that because of the physical distance between my world and that of Eritrea in Northeast Africa – where Tigrinya is recognized as an official language – I wouldn’t grow up to think that I could speak the language well enough thus reinforcing how much of an outsider I sometimes feel in a room full of Eritreans. During those seven weeks in the summer of 2014, while traversing Eritrea, I learned that my command of Tigrinya would dramatically improve with consistent practice and exposure to various forms of the language including its speech and written text. The language itself belongs to just one of nine tribes in Eritrea and is spoken by 5 million residents in the country. The number of descendants outside of Eritrea is unknown, however, I predict that number is more than the state’s estimated population. Tigrinya is also unique. Language from the country’s former colonial powers including Ottoman Turks (thrown out in 1848), Italy (1890-1940), England (1941-1951), and Ethiopia (1961-1991) are apart of Tigrinya today and words like “dukkan”, “fenistra”, “actually”, and “menalbat” can be heard peppered throughout a native speaker’s tongue. Tigrinya is also the language of love in my home. My parents use high pitches and intonations of phrases “Gele Aynet!”, “WAH. Anti, intay geriki?” and a favorite of mine: “Way Ma’At” when conversing with each other in the language. However, they have not always extended this love language to me thus leaving me to feel like an outsider or observer in the company of my own home, among my people. While my mother speaks to me mostly in Tigrinya and my father mostly speaks to me in English, neither of them have put pressure on me to respond in their native tongue. Little did I realize he would invite me to a private Facebook group for interested students, start an organization to increase opportunities for diaspora Eritreans called Bond Unbroken (BU), and launch an online class for those wanting to learn to read Tigrinya in two years. I signed up without hesitation. All one needed to join BU’s online Tigrinya Beginner course is a command of the English language and the desire to learn. The reason to join was and remains to feel more connected to my Eritrean heritage. OVER THE COURSE OF TWELVE WEEKS, I logged into my email account to watch and discover which letters we’d be following in a tutorial-style video set up in a well-lit classroom. 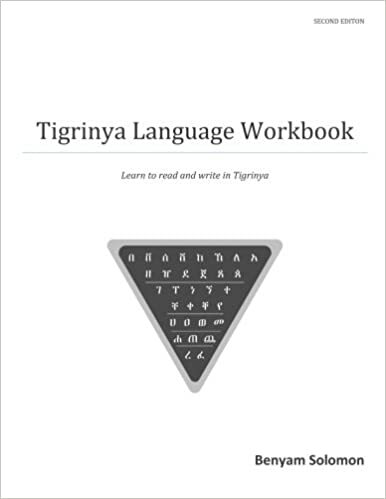 Prior to our start date, Haben — class instructor and founder of Bond Unbroken– made sure we were all armed with the second edition of the “Tigrinya Language Workbook” authored by Benyam Solomon, which you can access on Amazon for $9.49. How I learned to access Tigrinya in its written form in just three months was granted upon doing the following. If you want to learn the written form of Tigrinya, expect to make learning a part of your daily routine. As I imply earlier in this post, I am not an absolute beginner and because of exposure to the language, I knew every letter in the Tigrinya alphabet contained seven sounds, and knowing this, I set aside 30 to 60 minutes of practice every day reviewing the week’s letters and its accompanying sounds. I practiced my pronunciation of the letters while I was writing and rewriting them up to eight times in the accompanying workbook page (per Haben’s suggestion). Bonus tip: I also downloaded a free, tracing app on my smartphone that allowed me to trace any letter or word that I felt I could benefit from having more practice with. This helped me improve my penmanship and identify/memorize a comfortable stroke pattern for various letters. The hurtful experiences I’ve had with speaking Tigrinya until now have shaped my idea of how I thought I would perform while learning other aspects of the language. I thought it would be challenging to read Tigrinya because I struggled to speak the language confidently. Before I started the class, I had to accept that this notion was simply rooted in fear. In reframing my mindset, I decided to start with writing and reading letters that I did understand like “be,” “se,” and “ve”. Haben recorded his review of a group of letters and their sounds on a classroom whiteboard for students to watch every week. The letters were grouped by its shape. Letters that have two legs including “be” [በ], “ve” [ቨ], and “se” [ሰ] were featured in the first week. Letters that have one leg including “te” [ተ], “che” [ቸ], and “pe” [ፐ] were featured in the eighth week. No leg groups that were a personal favorite (because of its simplicity in sound and shape) included “we” [ወ], and “me” [መ] were reviewed in the sixth week. The course lasted 12 weeks. Each group of letters was related in its physical appearance which helped me predict how to write new letters as the class progressed. In time, I built confidence in my ability to not only read the letters but to write and say them. While taking the class, I was working full-time. I had spent hours on my lunch break focused on the class content and utilizing what was in front of me. I learned that I was satisfied and confident in the course materials provided — videos, worksheets, and the workbook — and continued to read the letters turned words turned phrases aloud and spell out my phonetic pronunciation of the content in English: ኸመይ ኸኒካ| Ke-mey Ke-ni-ka? The worksheets were designed by BU and fun to complete. The crossword puzzle featured in week nine prompted students to identify colors and days of the week written vertically, horizontally and diagonally on the board. Learning to read in Tigrinya was much easier than I had imagined. Using the techniques mentioned above, today, I am able to read and write in Tigrinya better than I ever have. I can identify 85 percent of the language’s 32+ letters and its accompanying sounds, and with the help of BU’s Online Beginner Tigrinya class, this is an achievement that I hadn’t thought of doing for myself previously, but am glad I did and so will you. Listen to this memo to hear the seven sounds of letters “be” [በ], “se” [ሰ] and “ve” [ቨ]. Loved reading this post! I could hear my parents saying these: “Gele Aynet!”, “WAH. Anti, intay geriki?” and “Way Ma’At”. I am with you; it starts with a mind shift. A good course like the one mentioned helps along the way. I’m glad you were able to draw similarities between our experiences as heritage Tigrinya speakers. I’ve read some of your writings–you were raised in the Middle East, yeah? If you had any structure with learning Tigrinya growing up, I hope you find time to write about it someday!